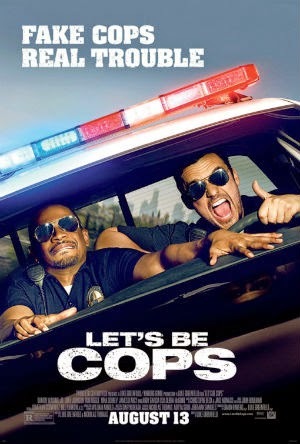 Let's Be Cops is similar to 21 Jump Street, but with enough differences to let it stand on its own two feet. Although the two main characters Ryan (Jake Johnson) and Justin (Damon Wayans Jr.) don't go to the academy to become official officers, one has a couple of uniforms on hand. They test them out at a costume party, which turns into a masquerade the whole movie long. After leaving their shindig, they head home they walk the streets of L.A. and realize civilians treat them like the real deal. After seeing the effects, they become intrigued and take their antics to a whole new level. It's a different approach but the comedy is great! Let's Be Cops has it's own take on the law. One of the characters gets so serious it becomes his persona. I went in with low expectations but came out with a happy grin. It was funny and while I had never really heard of the two main actors, Jake Johnson and Damon Wayans Jr. did a great job as a new comedy duo. The lead female role, Nina Dobrev, added a little romance to spice things up as well. Two nobodies become somebodies and get entangled in a mess they can't get out. Ryan and Justin have to correct their mistakes and, for the most part, have fun doing it. For a good laugh, go see this movie. Maybe a career in law could be your thing too?